Barcelona and Paris Saint-Germain’s star players, Lionel Messi and Neymar, are reportedly worth 2.5 times more than five-time Ballon d’Or winner Cristiano Ronaldo. 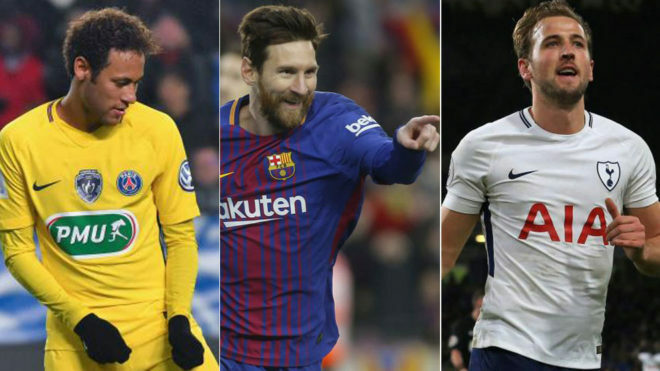 According to an annual report on the market value of footballers from the five major European leagues, this statistic regarding the top three players stole the headlines. The CIES Football Observatory, who recently published the report, took several criteria into account, such as the age of the player, the position, the duration of their contracts and their performances. It concluded that the player with the current highest market value is Neymar, valued at 213 million euros, which is nine million less than what the French team paid last summer to sign the Brazilan. Lionel Messi holds the second place, valued at 202m, followed by Tottenham Hotspurs star Harry Kane with 195m. However, Cristiano Ronaldo, the most successful player in the last year, is far from the top positions. The Real Madrid striker occupies the 49th position, with a price of 80.4m euros. Among the top 10 are five players who play in the English Premier League. In addition to Harry Kane, Dele Alli, Kevin de Bruyne, Romelu Lukaku and Paul Pogba are there. Only two LaLiga players: Messi and Antoine Griezmann (eighth) are in the top 10, with the Atletico Madrid striker having a market value of 150.7m. The first Spaniard in the ranking is Alvaro Morata, in twentieth position with an estimated value of 108m euros. Barcelona’s brand new signing, Philippe Coutinho is ranked 16 with a market value of 123m. Lastly, Virgil van Dijk, the most expensive defender in history, for which Liverpool have paid almost 78.8m euros, is valued at 50.8 m.